Reaper is a sidescrolling Hack and Slash RPG developed by Hexage, it has made the leap from mobile devices to PC, and is now available on Steam. You control a mysterious champion known as the Pale Swordsman and follow him on his quest across a war-torn nation, battling beast and man alike. The game takes part in two stages : Firstly the world in a top down view where your quests shall be followed and the RPG elements of the game come into play. You can use the gold they collect by completing quests or slaying enemies and use it to buy upgrades for armour or weapons. Standard RPG stuff. You will also have limited interactions with quest givers where dialogue can influence the outcome of exchanges. The second part of the game is the battles. Quests require the Pale Swordsman to venture over the map seeking items or ridding the world of beasts. The battles end when all enemies are slain. In between journeying across the map and slicing up enemies you collect XP from quests and level up accordingly, getting the chance to upgrade “cards” giving players such luxuries as bonus health or damage. These are essential as the difficulty of the battles scale as you progress through the game. This is nicely balanced as, although the levels clearly become harder, they are still manageable. The fact the game is a port is very noticeable in some of the game’s mechanics. This includes the “world” movement, the NPC interaction with quests and the combat itself. 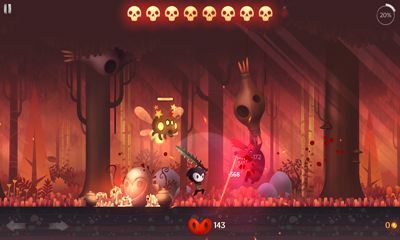 The world appears interactive at first but is simply a “click to start the next level” with the onscreen avatar automatically sliding to his new location for the next battle to commence. The same goes with the interactive choices players are given with the quests – usually in a “click a or click b” format. Neither have any seemingly meaningful influence over the story’s development and are there simple to break up the monotony of the sidescrolling action. The combat is for the most part automated. When the Swordsman is within range of an enemy he will auto attack until either an additional command is entered or he is out of range of the target. Auto attacks generate skulls which are essentially cashed in for bonus damage when a player wishes to attack manually. Although minimalistic in its design, the combat mechanics are strangely addictive and shouldn’t be written off before you give them a fair chance. On a mobile device this design is very intuitive as the input controls are lacking, but on a platform like the PC players have the capabilities of handling more intricate controls. The game has a nice overall visual design, more so in the battles than in the world, which by comparison is underwhelming. Again the original platform is obvious as the game would look great on a mobile device but doesn’t have that “wow” factor when transferred over to the PC. The art style is consistent throughout and provides a solid canvas for the game to play out on. The music reflects the gameplay well and provides a groovy backdrop similar but to a lesser extent than Hotline Miami but isn’t varied enough with different scores. The sound effects are very hit and miss with some questionable audio feedback from some enemies but for the most part they are on par with what is expected of a game of this size. Our time spent playing Reaper fluctuated between mildly enjoyable with the promise of more, to a monotonous grind. It was too much of the same thing with not enough variety available. It doesn’t stand out in the sidescrolling genre and if not for the polished art would be a forgettable title. For $5 though it doesn’t fleece your pockets and provides enough gameplay to be worth the investment, if you are a fan of the genre.